Tribal masks have been part of the dance regalia and traditional ceremonies of many Native American tribes since ancient times. The most renowned native mask-makers are the Northwest Coast Indians, who carve elaborate cedar dance masks. The most impressive of the Northwest masks, known as transformation masks, could be opened at a pivotal point in the story to reveal a second face carved within the first one. 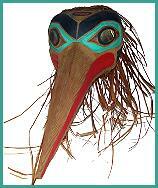 There are ceremonial mask traditions within many tribes outside of the Northwest Coast as well. The Hopi and other Pueblo Indians carve and paint wooden kachina masks for their traditional dances, the Iroquois create sacred "false face" masks from wood and corn husks, the Inuit carve small masks called finger masks that dancers wear on their hands, the Navajo and Apache make leather masks for dancing, and the Cherokee would craft gourd masks for storytelling. Cherokee mask art has fallen into decline since the forced removal of the Cherokees to Oklahoma, where their traditional mask materials were not available, but some artists are working to revive the tradition. Southwestern and Northwest Coast mask carving remain a vibrant part of contemporary native culture. Today most American Indian masks are used for dances, cultural drama, decoration, and as crafts for sale. If you are looking to buy a tribal mask that was actually made by Native Americans--either because it's important to you to have the real thing or because you want to support native people with your purchase--then here is our list of American Indian mask artists whose carvings are available online. If you have a website of Indian art masks to add to this list, let us know. We gladly advertise any individual native artist or native-owned mask store here free of charge, provided that all masks were made by tribally recognized American Indian, Inuit, or First Nations artists. Thank you for your interest in Native American masks! On our main site we do our best to avoid slowing down our page loading with graphics, but this page is about art, so we'd really be remiss in not showing a few representative mask pictures. All photos are the property of their respective artists; please visit their sites to see their work in more depth. A collection of contemporary Northwest Coast masks, from a native-owned British Columbia crafts store. 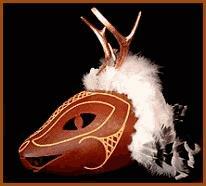 Ceremonial and decorative Pacific Northwest masks from Haida, Salish, and Nootka Indian carvers. Northwest Coast Indian masks and war helmets carved by a Tlingit artist. Gallery of Pacific Northwest Native American masks, totem poles, and other fine wooden carvings. Cherokee booger and effigy masks, carved traditionally from gourds (also a few copper ones). Email the artist to commission a mask. The Huichol have a unique tradition of making indigenous Mexican ceremonial masks and bowls by coating their carving with beeswax, then pressing beads into the wax to make colorful beaded designs. Some types of genuine Native American masks can never be found for sale. The reason is that these special masks have too much sacred importance to the tribes that make them. Just as the Catholic Church forbids the sale of holy relics, some Native American tribes have forbidden the sale of sacred masks. The two best-known types of sacred Native American masks are the false face masks of the Haudenosaunee (Iroquois) tribes and the kachina masks (also known as spirit masks) of the Hopi Indians. If you see a false face or kachina mask for sale anywhere, it is either stolen or (much more often) a forgery. Iroquois false face masks are considered so sacred that they are not even permitted to be viewed without the proper ceremony. There is some disagreement among Iroquois people about whether it is unacceptable to sell or display any false face style mask, or just true false faces that were carved from a living tree and used in religious ceremony ("live" masks). Some carvers sell "non-live" Iroquois masks in the false face style that they made specially for sale, while others disapprove of this. As in any belief system, not all individuals share the same religious interpretations. However, everyone agrees that it is profaning the Iroquois religion to buy or view a living false face mask, so to err on the side of respect, we will not link to any false face pictures here. Hopi kachina masks may be viewed by anyone, and visitors are even welcomed to many of the kachina dances where these masks are used. Here is a great book by a Hopi author with many pictures of the Hopi masks and regalia used by kachina dancers. However, because Hopi masks are considered living spirits, they are not allowed to be removed from the dances and ceremonies they are integral to, which means they may not be sold. If you are interested in purchasing Hopi kachina art, kachina dolls are a great choice. These figurines represent the same spirit beings who are channeled by the kachina masks, including miniature carvings of the original Hopi dance masks. These dolls were traditionally used to honor the kachinas and teach the younger generation about them. Many of them are very beautiful, and the Hopi tribe supports their sale. History and photographs of ceremonial Pacific Northwest native mask art. Dance masks of the Mexican Indians, with photographs and information about the dances they are used for. Illustrated museum book with hundreds of photographs and descriptions of native Alaskan masks. A good book on American Indian art history in general, from ancient times to today. Northwest Coast Native American Masks: Photoessay on the traditions, technique, and animal symbolism of Northwestern Indian dance masks. Native American Masks of the Northwest: Online Northwest Coast mask exhibit from the Museum of Natural and Cultural History. Northwest Coast Masks and Headdresses: Collection of Northwest mask photos, also with a map of the Northwest Coast tribes. Our Way of Making Prayer: An online museum gallery of the history and tradition of Yupik Eskimo masks. Aztec Ceremonial Masks: Illustrated essay on the meaning of ancient Aztec masks. Jaguar Helmet Masks: Article about pre-Columbian Mayan and Aztec mask traditions and their influence today. False Face Masks: Explanation of the Haudenosaunee position against the sale or exhibition of sacred false face masks. 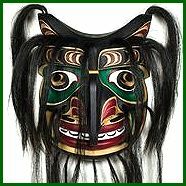 Transformation Mask: Wikipedia article about hinged masks of the North west Coast. Masks Around the World: Exhibit of tribal masks from the Museum of Anthropology, including Inuit, Native American, and South American Indian masks. American Indian Cultures: View our pages for individual Indian tribes, most of which have artistic information. About us: This website belongs to Native Languages of the Americas, an non-profit organization dedicated to preserving and promoting endangered Native American languages. We are not artists ourselves, so if you are interested in buying some of the masks featured on this page, please contact the artists directly. Though we have featu red only Native Indian masks identified with the name and tribal affiliation of each artist, we haven't called the tribal offices to check up on any of them, and we only know a few of them personally. We also don't guarantee any of their products. This is not an exhaustive list of Native American masks--if you would like us to add your mask site to this page, please contact us with your URL and tribal affiliation. We advertise any individual native artist or native-owned art business here free of charge. We do not link to masks which are not made by tribally recognized American Indian, Inuit, or Native Canadian artists, so please do not ask us to. We also do not link to Iroquois false face society masks due to controversy over their appropriateness as art objects. And finally, websites do occasionally expire and change hands, so use your common sense and this general rule of thumb: if the creator of each individual artwork is not identified by name and specific tribe, you are probably not looking at a genuine Native American mask.